I finally after all these years know how to serge corners. My serger had to go into repair because it started to squeak after I tried making the wave stitch on it. Luckily it only needed cleaning out and lubricating, nothing major. Except the repair guy broke part of the thread mast by not putting it down all the way before he put it on its side to undo the bottom. He said he would try to order another one if the glue he put on doesn’t hold. It only effects the look not the function of the machine in anyway. Now about serging corners. Since I wanted to try out the machine and listen for squeaks, I thought I might as well work on my corner skills. Here is what I figured out. It is probably written in a book or two, just not the ones I have read. -First cut the corners to be serged about 1″ more than the amount being taken off on the each side. So 3 corners need to be prepped for a square. -Serge down the first side stopping at the end and not beyond. -Raise the needle to the highest position. -Pull a little on the needle thread to loosen it. How much thread to loosen is determined by trial and error. -Next lift the presser foot and carefully pull the fabric off the toe holding the last few stitches. -Turn the fabric and reposition to serge down the next side. The fabric that needs to be cut off should start just past the knife. Serge each side the same way and finish off the last corner in your usual manner. I pull a bit of serger tail back through the preceding stitches with a latch hook. I use to do all 4 corners that way. This is going to save me so much time and look nicer too. I had heard about pulling the needle thread loose to reposition a corner, but I had to figure out the taking the thread off the toe and prepping the corners. I also heard to tighten the needle thread back up, but there was nothing to tighten as I tried not to move the fabric very far. This new skill won’t amaze anyone reading this. Though I am pretty happy about it. This entry was posted on Tuesday, August 18th, 2009 at 3:00 am and is filed under Sewing. Tagged: Sewing. You can feed this entry. You can leave a response, or trackback from your own site. Thanks for the tip. I’m confused about step one. 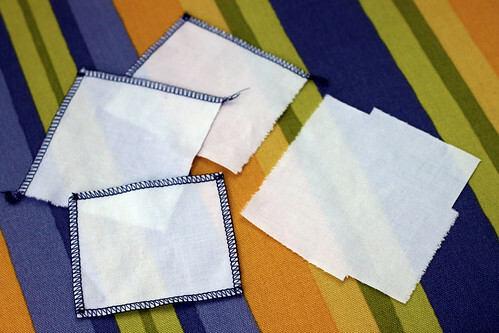 When you say cut the corners 1″ more than the amount being taken off each side and then prep 3 corners, I’m imagining that allows the next side to go under the knife when you turn the fabric, but the clouds in my brain aren’t parting quite enough to get this. Could you clarify?